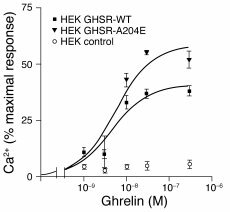 Calcium response to ghrelin of the WT and A204E GHSR1a receptors stably expressed in HEK293 cells. The HEK293 clones expressing the WT or the mutant receptor were selected on their similar GHSR1a expression pattern. GHSR1a-expressing cells and untransfected control cells were stimulated with increasing concentrations of ghrelin. The intracellular Ca2+ release was monitored by means of the Fluo-4 AM fluorescent probe. Each signal, which represents the mean of triplicates, is expressed as the percentage of total calcium release after ghrelin injection; total calcium release within a well corresponds to the peak obtained after cell lysis in the presence of 0.2% Triton. A representative experiment of 3 independent experiments (each performed in triplicate) is shown.